All four images show a central dark region surrounded by a ring of light that appears lopsided—brighter on one side than the other. On any given day, each telescope operates independently, observing astrophysical objects that emit faint radio waves. However, a black hole is infinitely smaller and darker than any other radio source in the sky. To see it clearly, astronomers need to use very short wavelengths—in this case, 1.3 millimeters—that can cut through the clouds of material between a black hole and the Earth. For EHT, the eight participating telescopes summed up to a virtual radio dish as big as the Earth, with the ability to resolve an object down to 20 micro-arcseconds—about 3 million times sharper than 20/20 vision. By a happy coincidence, that's about the precision required to view a black hole, according to Einstein's equations. On April 5, 2017, the EHT began observing M87. After consulting numerous weather forecasts, astronomers identified four nights that would produce clear conditions for all eight observatories—a rare opportunity, during which they could work as one collective dish to observe the black hole. "We're recording gobs of data—petabytes of data for each station," Crew says. In total, each telescope took in about one petabyte of data, equal to 1 million gigabytes. Each station recorded this enormous influx that onto several Mark6 units—ultrafast data recorders that were originally developed at Haystack Observatory. As each telescope occupies a different location on the EHT's virtual radio dish, it has a slightly different view of the object of interest—in this case, M87. The data received by two separate telescopes may encode a similar signal of the black hole but also contain noise that's specific to the respective telescopes. His concern was short-lived. 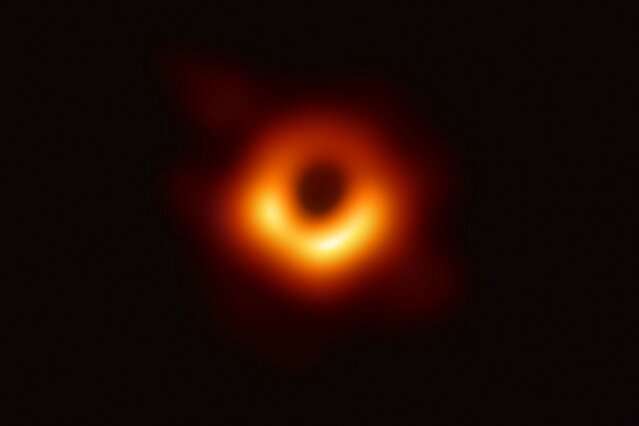 Soon afterward all four teams met at the Black Hole Initiative at Harvard University to compare images, and found, with some relief, and much cheering and applause, that they all produced the same, lopsided, ring-like structure—the first direct images of a black hole. The idea for the EHT was conceived in the early 2000s by Sheperd Doeleman Ph.D. '95, who was leading a pioneering VLBI program at Haystack Observatory and now directs the EHT project as an astronomer at the Harvard-Smithsonian Center for Astrophysics. At the time, Haystack engineers were developing the digital back-ends, recorders, and correlator that could process the enormous datastreams that an array of disparate telescopes would receive. Actually, the picture realised by EHT team is a just an additional confirmation of the "galactic toroidal plasmoid". Also it affirms the plasma cosmology hypothesis that the object at a galactic core is not a BH at all but an ultra-high density energy storage phenomena called a PLASMOID. Plasmoid has been predicted by the Physicist Winston H. Bostick. Bostick's theoretical prediction has been confirmed experimentally and also the different properties and geometrical shapes of plasmoid has been well investigated in many laboratories. ‒ Winston H. Bostick, "Possible Hydromagnetic Simulation of Cosmical Phenomena in the Laboratory" (1958) Cosmical Gas Dynamics, Proceedings from IAU Symposium no. 8.